Tom is one of the newest members of the Sheerwater Glass team, joining us only a couple of months ago as an installer. Lucky for us, he brings with him a wealth of experience. Today, we found out about his new job role and life before Sheerwater Glass. What were you doing before you joined Sheerwater Glass? I worked for over 10 years as an installer for another window company. Then I spent 4 years in the RAF specialising in operations; planning missions and supporting the aircraft while on task. I was lucky enough to work with the Royal Squadron, they support the Royals and VIPs! Why did you decide to work for Sheerwater Glass? I needed a change and wanted a challenging job to fit in around my family. I chose to work at Sheerwater Glass because I was impressed with the set up of the company and the people skills of the management. It is nice to work for a company who appreciate their staff. Briefly describe your job as an Installer and the skills which you need. 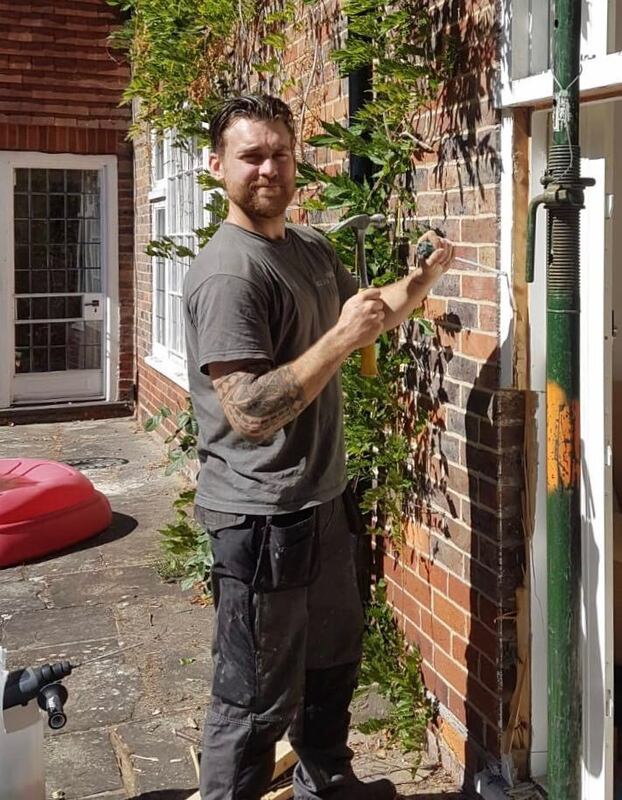 My role is to fit new products – these can range from doors to windows, conservatories to roofline products, and I even do some service engineering when required. I am also currently training a trainee. Being an installer varies from day to day. The most important part of this role is experience, but you also need to be able to communicate with clients and the office, so being a good communicator is key. I would also say that timekeeping and problem solving are qualities that make a good installer. My typical day most importantly starts off with a coffee. Usually, we organise the van and load up the job with the view of arriving at a client’s house for about 8.30am. We would then spend the morning removing the old doors/windows and replacing them before lunch. After a quick sandwich, we then begin trimming, cleaning and sealing the windows, ready for the client to enjoy their new product. I enjoy the variation of the job, no day is the same. It also helps me stay fit as I am active all day. It’s always great when a job is complete and the client is thrilled with work done at their property. I no longer have free time as my son is 8 months old! If I do get some time, I will try to exercise; I enjoy running and bodyweight training. Sunday mornings I try to get us out for a walk in the woods or the South Downs. Graduating into the Royal Air Force, the feeling on completion of the pass out parade is amazing! To get a few more hours sleep, my son hasn’t slept through since he was born!